Striker Callum Robinson is hoping Preston will reap the benefits from his new found status as an international footballer. The 23-year-old made his debut for the Republic of Ireland last Thursday when he started up front against Wales in the Nations League at the Cardiff City Stadium. Although his first appearance for his country did not have a happy ending – the Irish being on the receiving end of Gareth Bale-inspired 4-1 mauling – Robinson certainly acquitted himself well. So much so that he was handed another start on Tuesday as Martin O’Neill’s men drew 1-1 against Poland in Wroclaw. On both occasions, Robinson was withdrawn deep into the second half – replaced by club mate Graham Burke against Wales – but the former Aston Villa man certainly did enough to suggest that he has a bright future ahead at the highest level. Having returned to club duty on Thursday in preparation for this weekend’s home game against Reading at Deepdale, Robinson admitted he did not feel too much different having made his international bow. But he believes the experience will have a beneficial effect going forward in his football career. “It was really good,” said Robinson. “I really enjoyed it. “The lads were great, the staff were great – it was a really good experience. “As a Preston North End player, it was great to go and represent the Republic of Ireland and I have come back having had some really good experiences. “I was really happy getting called up first of all and then on the day when the gaffer said I was going to start, I was really happy. “It was a really proud moment for me and my family who were in the stands. “It wasn’t a good result, but personally I was really happy. “When the gaffer told me I was starting I was a little bit nervous,there were a few butterflies in the belly. Robinson revealed that his experience of international football for the very first time felt quite different to what he is used to, playing for PNE in the Championship. “The standard is better,” he said. “Against Wales you’re coming up against Gareth Bale and Aaron Ramsey, who are top players. “They obviously have good players around them as well. On a personal level, Robinson felt he performed well in both games and was slightly disappointed that he had not managed to mark his debut with a goal, having had a couple at sighters . “It was hard against Wales because we didn’t have a lot of the ball, but I felt when I had it, I did well,” he said. “I probably should have scored. I was a little bit upset with one of them, I should have hit the target. With the European Championships coming up in two years’ time followed by the World Cup, in Qatar in 2022, Robinson admitted he is excited by what the future may hold. “It is really exciting,” he said. “We have got a lot of good young players. Preston boss Alex Neil believes Robinson’s international call-up is a reward for the way he has matured as a player over the past year or so at Deepdale . Having started out of the team at the beginning of Neil’s tenure last year, the young forward has become one of the first names on the team-sheet and has featured in every league game so far this season. Neil said: “I think it’s good when players play for their country. “It’s good for their confidence and good for their profile. “Callum for me has arguably been our most creative player this season. “I think he will have a really good career. “The difference you see in him from last year to this year has been significant. He has matured. “I think players can show as much potential as they like, but they need to continue to develop and improve. Robinson himself admitted his club manager has played a significant role in his elevation to the international stage. “The gaffer here has helped me to get my chance with Ireland,” Robinson said. “I think he has developed my game a lot and that is why I am getting my chance. 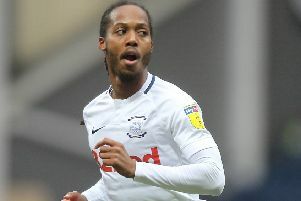 Robinson notched his first goal of the campaign in PNE’s last match before the international break. He opened the scoring in the first half as PNE went on to open up a two-goal advantage. However, it was a lead they could not hold on to as Wanderers stormed back to earn a point. The final result was particularly hard to take as North End have not picked up a victory in the league since the 1-0 opening-day win over QPR. Robinson believes North End , who are currently in 19th spot in the Championship, deserve to have more points on the board. This weekend’s clash against rock-bottom Reading should provide a great opportunity for PNE to return to winning ways in the league, although Robinson is not taking anything for granted.